The R.J. Toomey mozzetta is a type of short sartorial vestment that is often described as an elbow-length cape. The mozzetta covers the shoulders and buttons over the front of the chest. It is normally worn over the rochet and is worn by high ranking clergy such as the Pope, cardinals, bishops, abbots, canons and more. The color of the mozzetta is indicative of the position of the wearer. 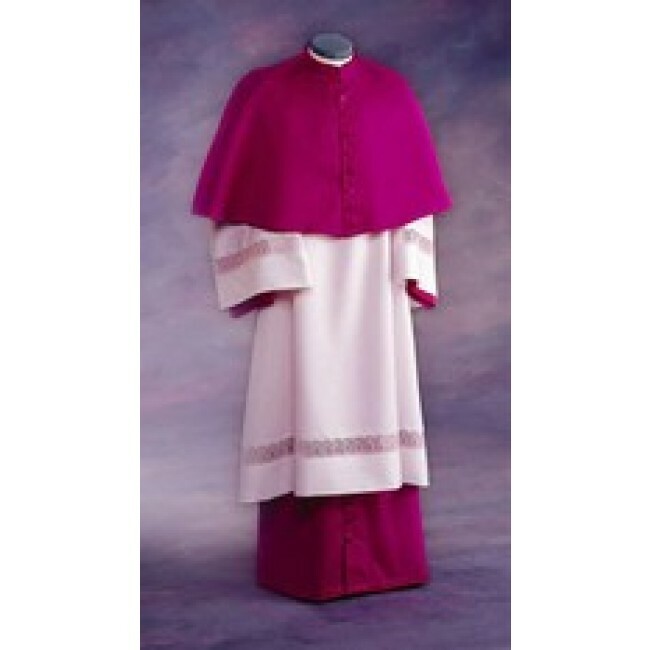 Cardinals wear a scarlet color while bishops and equivalent persons wear a violet mozzetta. Rectors and some canons wear black with red piping while other positions may wear various colors depending on the church. The custom tailored mozzetta is available in red or purple to suit your needs and is the standard elbow-length. The mozzetta is buttoned over the breast and includes matching cord piping trim. It is made of 100 percent woven polyester and has standard buttons. Cloth covered buttons may be added for an additional charge. The garment is dry clean only. Prices are based on standard cassock sizing only. For special size orders, please call our friendly customer service staff for a price quote.